Trump Administration Asks For More Time To Provide Proof That Obama Wiretapped Trump : The Two-Way The House Intelligence Committee had requested any applications for surveillance of Trump or his associates made under the Foreign Intelligence Surveillance Act. Obama has said the claim is baseless. 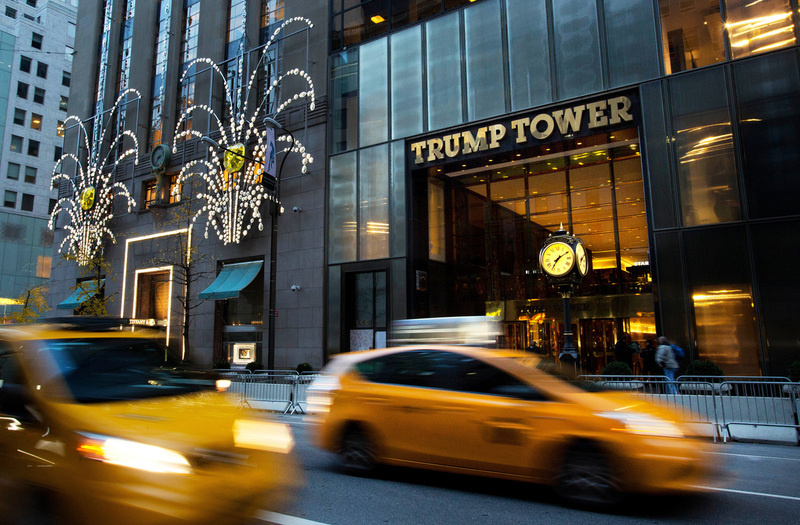 Traffic flows past Trump Tower in New York in November 2016. The Trump administration wants more time to produce evidence that then-President Barack Obama ordered surveillance on Donald Trump during last year's election. Trump says his predecessor ordered his "wires tapped" in Trump Tower. The Justice Department has asked for more time to respond to a congressional committee about any evidence that President Barack Obama ordered surveillance of then-candidate Donald Trump last year, as Trump has claimed. The House Intelligence Committee had set the deadline of Monday in a letter to Acting Deputy Attorney General Dana Boente last week in which it asked for proof of the claim, which Obama and others have said is baseless. Committee Chairman Devin Nunes and ranking Democrat Adam Schiff requested any applications for surveillance of Trump or his associates that were made under the Foreign Intelligence Surveillance Act, or any court orders supporting such surveillance made by the Foreign Intelligence Surveillance Court, NPR's David Welna reports. David adds that a copy of the letter also was sent to FBI Director James Comey, who has asked the Justice Department to publicly deny President Trump's claims. "This afternoon, the Department of Justice placed calls to representatives of the Chairman and Ranking Member of the United States House Permanent Select Committee on Intelligence to ask for additional time to review the request in compliance with the governing legal authorities and to determine what if any responsive documents may exist." The wiretapping claims came as the House Intelligence Committee was already in the process of looking into U.S. allegations that Russia sought to influence last year's presidential election — allegations that have also included ties between some in Trump's camp and Russian officials. Nunes has said the panel will also look at the president's accusation. Sen. John McCain is among those who have asked for proof of Trump's claim, telling CNN on Sunday, "I think the president has one of two choices: either retract or ... provide the information that the American people deserve, because, if his predecessor violated the law, President Obama violated the law, we have got a serious issue here, to say the least." Monday's deadline came more than a week after Trump said Obama "was tapping my phones in October," in a series of tweets that accused his predecessor of "McCarthyism" and called Obama a "Bad (or sick) guy!" Trump did not provide any evidence to bolster his claim; instead, the White House released a statement calling for Congress to investigate the allegations made by one president against another. As NPR's David Folkenflik has reported, Trump's claim is seen as having its origins in a March 2 broadcast by conservative talk radio host Mark Levin, who accused Obama "and his surrogates" of using "intelligence activities to surveil members of the Trump campaign" to help Democratic candidate Hillary Clinton. After that, David said, the claim was repeated by the Breitbart website. "That seems to have inspired, very directly, a series of tweets," Folkenflik said. Obama spokesman Kevin Lewis says the Obama White House observed a policy against interfering with "any independent investigation led by the Department of Justice." Lewis added, "As part of that practice, neither President Obama nor any White House official ever ordered surveillance on any U.S. citizen. Any suggestion otherwise is simply false." The morning after Trump made his claim, principal deputy press secretary Sarah Huckabee Sanders was asked about it on ABC's This Week; here's what she said: "Look, I think he is going off of information that he's saying that has led him to believe that this is a very real potential."